The most important gift Sri Lanka ever received from overseas, the message of the Gauthama Buddha has introduced a unique religious philosophy together with a new culture and a way of life to the people of this country. 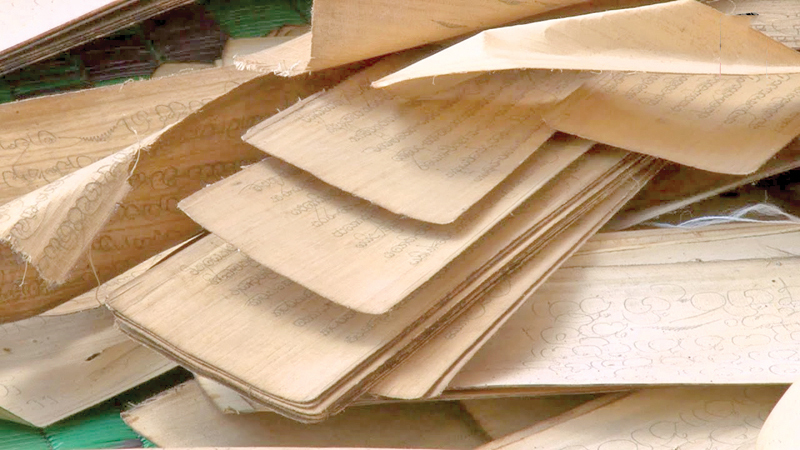 The teachings of the Buddha or the Thervada Tripitaka was introduced by Arahath Mahinda in Pali language and it was brought forward by word of mouth for generations until it was transcribed into written text on Ola leaves in the 1st Century at Aluviharaya in Matale. In a significant move to provide the long due proper status to the Tripitaka, it is to be proclaimed as a national heritage by President Maithripala Sirisena tomorrow (January 5). 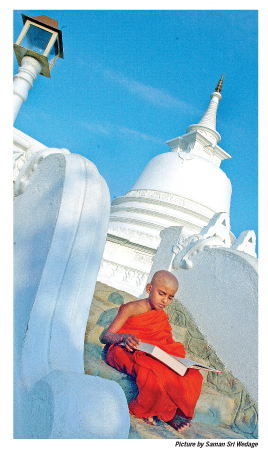 The Pali Tripitaka volumes considered as the foundation source of the Sri Lankan Buddhist tradition. Tripitaka Dharma constitutes of the Sutra Pitaka, Vinaya Pitaka, and the Abhidharma Pitaka as well as the Atthakatha and Teeka. This is one of the most prominent sacred religious heritages in the world history which was brought forward for generations by listening to verbal recitations and memorizing. From the first Dhamma Sangayana (First Buddhist Council) to the transcription of the Tripitaka at the Matale Alu Viharaya in 1st Century A.D, the Maha Theras and their student generation preserved this Dharma through oral form. The Buddha’s teachings were divided into nine parts during his lifetime and during the first Dhamma Sangayana it was divided into three parts as Sutra Pitaka, Vinaya Pitaka, and the Abhidharma Pitaka. The Dhamma preached by the Buddha for over 45 years was preached by 500 bhikkhus jointly by memorizing those teachings, at this first Dhamma Sangayana. Since then the great responsibility of preserving this Vinaya Pitaka for the benefit of the Sasanaya was vested on Ven. Upali Maha Thera and his student generation. There are some controversial points regarding Theravada Tripitaka. According to Bertram G. Liyanage of the Editorial Team of the Encyclopaedia of Buddhism, one of the issues is whether Theravada Tripitaka is the most accurate and original words of the Buddha. The Buddha once admonished to study his teachings in ‘one’s own dialect’ (sakaya niruttiya). The Pali term in this context can be interpreted in two ways. First, it says ‘in the language of the Buddha’ and secondly ‘in the language of oneself (the hearer). At the very outset, Sri Lankan Theravada tradition seems to agree with the first interpretation ubiquitously. This agreement led them to infer logically that Arahant Mahinda Thera introduced Tripitaka to Sri Lanka by the language of the Buddha, Pali. Subsequently, Pali language was further promoted by adopting the concept of mulabhasa, which introduces the Pali as original or natural human language. Although there is an acceptance by many that Buddha spoke Magadha, even today, orthodox Theravada Theras strongly maintain that Theravada Tripitaka contains original words of the Buddha as he delivered. However, modern scholarship is reluctant to be compromised with this view due to various reasons. They maintain that there is no assurance that only the Theravada Tripitaka represent the true teachings of the Buddha, Bertram Liyanage concluded. Over the years, the responsibility of carrying forward the Tripitaka was given the Bhanaka Theras or the monks assigned to preach. Accordingly, Bhanaka Theravaru was titled as Diga, Majjima, Sanyuktha, Anguththara, Dhammapada and Maha Ariyawansha and in ancient Sinhala stone inscriptions (Shilalipi) they were named as Majimabanaka, Sayunabanaka, Utharabanaka and Pelabanaka. The responsibility of a Bhanaka is to carry forward the Dhamma from generation to generation. The well experienced and intelligent monk will achieve the status of Bhanaka for the section of the Tripitika, which he can memorize in a more sustainable manner. Accordingly, the monk who learns the first 50 Suthra of Majjima Nikaya will be called as Majjima Bhanaka while the monk who knows the Jataka tales, Atuas and Dhammapada by remembrance were called Jataka Bhanaka. The monks made tremendous sacrifices to ensure preservation of the Tripitaka. The chief monks took every possible step to protect the erudite Theras who knew the Tripitaka by memory. During prolonged famine, there were fears that might disappear totally and some of them were sent to different places, even overseas to ensure all the Bhanaka Theras would not extinct. According to the chronicle Manorathapuraniya, 60 monks travelled to Malaya Rata with the aim of preserving the Tripitaka Dharma by saving their lives. They survived by eating the roots and leaves of the trees as there was no food during the famine. Some monks travelled to South India for the same purpose. Once the importance of transcribing the Tripitaka to ensure its eternal preservation was realized, the leading monks succeeded in obtaining the sponsorship of King Wattagamini Abhaya, popularly known as King Walagamba in the 1st Century AD. The writing of Tripitaka served immensely for preservation and propagation of the Buddhist Sasana. The United Nation Organization has acknowledged Sri Lanka as the centre of Theravada Buddhism and subsequent to that recognition, President Maitripala Sirisena proclaiming the Tripitakaya as a national heritage is a proud moment for the nation. Once the Tripitaka is proclaimed as the national heritage, the rights of publication of Tripitaka will be under the Ministry of Buddha Sasana. This will put an end to the attempts to give irrational connotations and interpretations to the words of the Buddha or to add new words to the Pitaka books and code f discipline that preserved the dhamma and the Buddhist order. As Buddha said, “Dhammo Bhave Rakkathi Dhammachari” meaning that no evil force could harm a person who practices Dhamma. It's not a national 'heritage', it's a national treasure.